As the industry transitions to file-based delivery and mastering, we saw a need for managed long-term archiving. Most of our customers already store digital files, but they dont have a long-term archive solution. An archive requires considerable investment in hardware, software, and expertise. For many companies, the cost of a reliable single-owner archive is prohibitive and the risk of not having one is unacceptable. It may seem simple to go to the local computer store, buy a couple of USB disk drives, write the content to them and put them on the shelf. But thats not a good long-term idea for media, as this sort of disk drive is designed to last no more than a few years in reasonably constant use. Leaving them on the shelf means theyll almost certainly fail the first time you go back to them, so your media assets still have no protection. Most data loss is still due to operator error, and content on drives is at its greatest risk when it is being accessed. So assets are most vulnerable when they are most needed. An archive eliminates that risk by storing multiple instances of a file, and all operations are carried out on copies. The original instance is always left un-touched. In the long term files and formats need periodic migration to remain accessible. Just as a tape format requires a specific deck to play it, disk and file formats need compatible file systems and software to remain playable. These migrations are included in the BBC S&PP service charge avoiding the costly one off transfer costs that tape owners are now facing. Content owners are seeing increasing benefits from accessing, distributing and monetising digital files rather than maintaining their valuable archives as old legacy tape formats sitting on shelves. Its not only these antiquated tapes that need to be preserved, the technology to play them back is equally important. 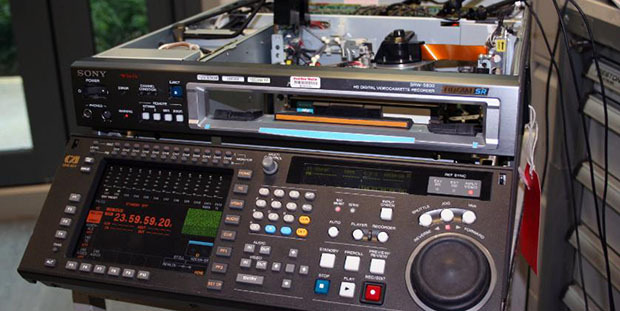 BBC S&PP continues to run a machine repair shop for VTRs and cameras, and offers its services to the open market. When we digitise tapes for archive, it makes sense to keep everything as perfect as possible for that one last playout, says Kevin Shaw Head of Technology and Restoration. The critical point to remember is that, if an archive is on tape, you have to address this issue now. Every time a tape is played it is being worn, reducing its quality the next time it is played: tape has a very finite life. And, of course, its increasingly difficult to find players for the many tape formats weve seen over the 60 year life of video recording. Film is also fading away, and BBC S&PP naturally offers film digitisation and restoration too. However, whilst the demise of film is well publicised, it has a proven better longevity than tape. Ironic when many film assets were once transferred to video- tape for preservation. It is not just broadcasters and production companies who have audio-visual assets. Universities, charities and cultural organisations have collections which represent an important part of their heritage, which should be preserved because it will have value, in some way, in the future. As a result of investing in this software ourselves and offering archiving as a service, BBC S&PP DMS can provide customers with all the benefits of long-term archiving at a lower cost. The archive service is a popular added value for our many digitization clients because we can keep a disaster recovery instance in offline storage in case of problems with their own WIP storage.